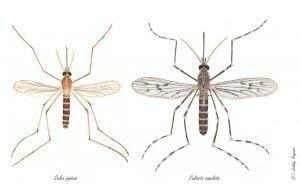 In Central Europe, there are predominantly two species of mosquitoes found in human surroundings: the common house mosquito (Culex pipiens) and the banded mosquito (Culiseta annulata). Both have very similar ways of life, and often coexist. 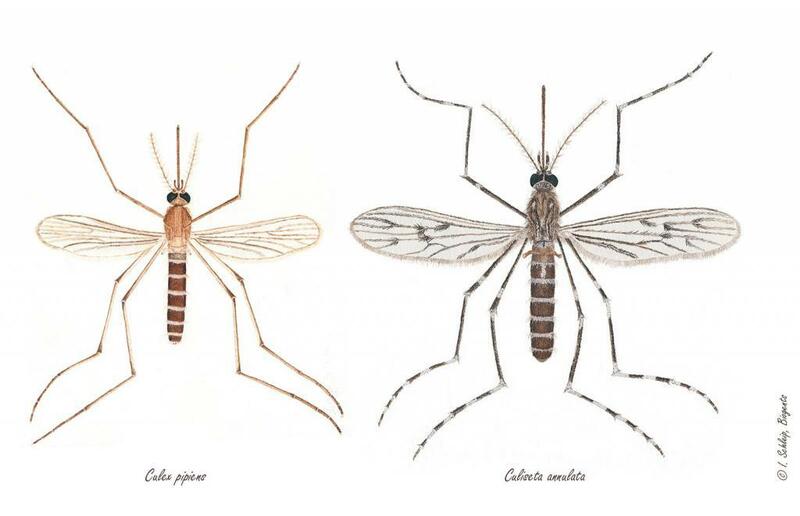 The common house mosquito is relatively inconspicuous: brownish with beige bands over the abdomen, and evenly coloured grey wings and dark legs. The banded mosquito is larger and stronger, the abdomen is black and grey with light transverse markings, and the legs have white rings. There a few indistinct dark spots on the wings. Both species lay their eggs in rafts of a few millimetres length that float on the surface of water in rain barrels, watering cans left standing around, clogged drains, ditches, garden ponds, or puddles. Each of these egg rafts comprises up to 350 eggs. Larvae that hatch from the eggs hang at the surface of the water, and breathe air through a snorkel-like siphon on their abdomen, but can go underwater in case of danger. As with all mosquito species, there are four larval stages with the largest one being up to one centimeter long. The larvae of house mosquitoes likewise feed on organic material, which they draw out of the water with their mandibles. House mosquito larvae can even live in sewage water and other highly polluted waters. The larvae and, accordingly, the mosquitoes they metamorphose into may be larger or smaller, depending on the supply of nutrients. The temperature of the water influences the speed of development: In warm summers, for example, the larvae may already complete their development within less than a week. Whereas the males die in the autumn, female house mosquitoes escape increasingly cold temperatures by retreating into human dwellings among other places initially. They can become really annoying here once more. They survive the winter in cool and moist spots like cellars, storage rooms, stables, and barns. If there are sufficient heat and blood hosts in spots with collections of water (factory halls, subways), the development cycle may continue during the winter as well.